This project was created for one of my club night make and takes. The flower is Chocolate Baroque Swirl Centre Flower and I have embossed it in silver and then coloured in blue using my Koi pens. The flower has then been cut out. 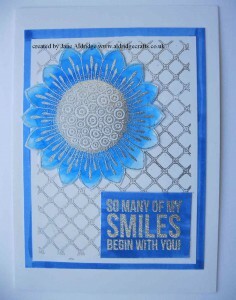 The background is a simple silver embossed with Chocolate Baroque Studded Lattice stamp. I’ve then cut out a mount of card out of white and coloured the edge with my Koi pens to match and mounted onto a 5×7 card. The greeting a Kaisercraft stamp from my stash and is also embossed in silver and coloured with Koi pens. 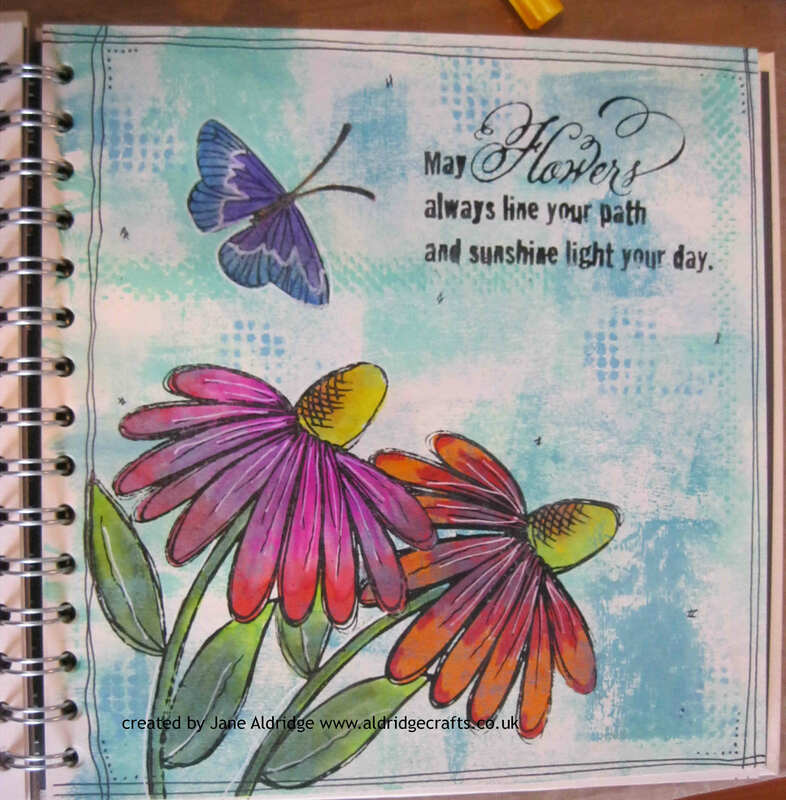 I love to create pages in my journal book. 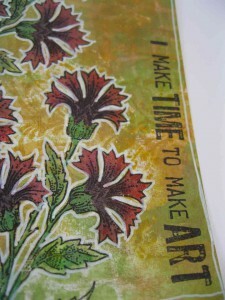 I think because I know I am creating them for me to keep, I treasure the creative process just that little bit more! This was created for my Youtube tutorial video, which you can watch here. 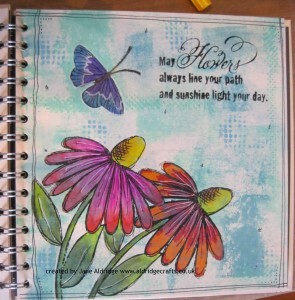 I’ve used the Woodware Whimsical Flower stamp with a mix of Distress Paints and Koi colouring pens. Back again for another entry to the Chocolate Baroque Colour Challenge blog. It’s great fun to challenge yourself with colours that you wouldn’t always use! 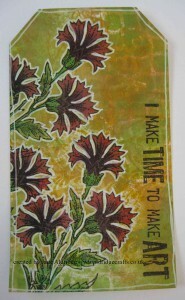 Today’s tag uses Distress Paints in Mowed Lawn, Antique Bronze, Antique Linen and Fossilized Amber. 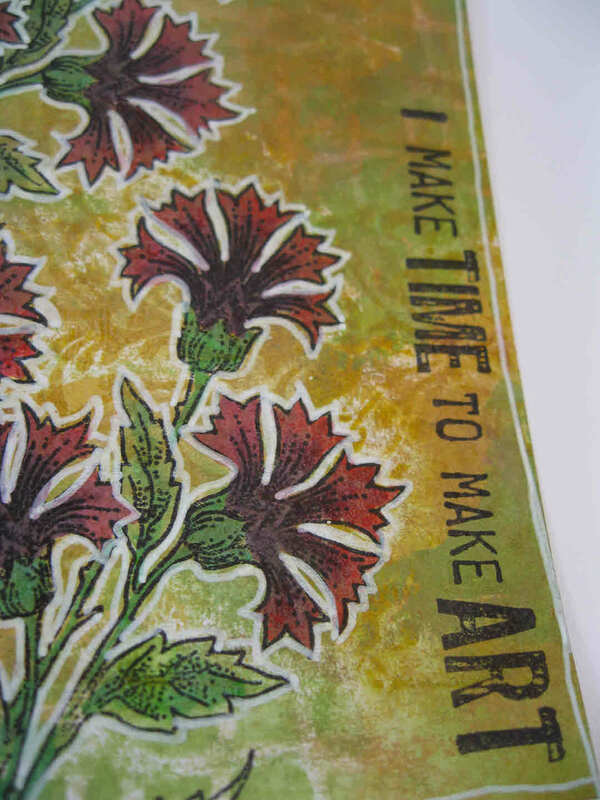 I started by creating a background with the paints using a brayer and swiping different colours. Then I have stamped using fossilized amber and the Chocolate Baroque Damask Panel stamp horizontally across the tag and then added some detail using the Open Weave stamp and Floral Weave Stamp. The wording is from the Artistic Affirmations set. 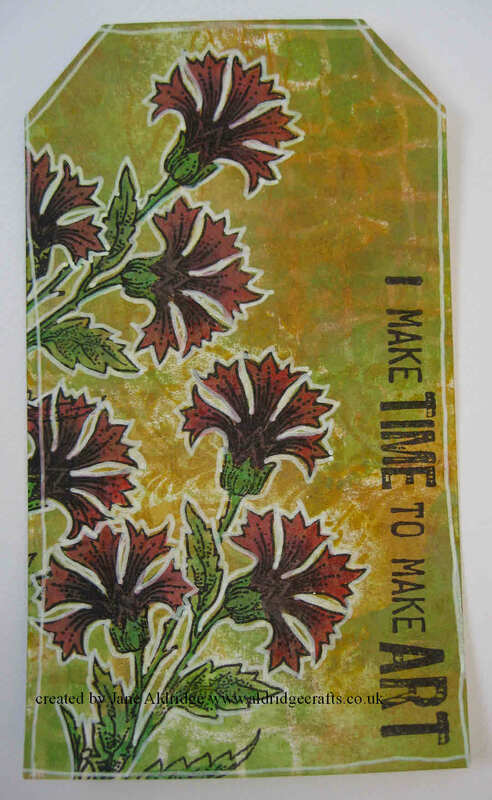 Next I stamped my Chocolate Baroque Cornflower stamp in Archival black and coloured using my Koi Brush pens. Some white highlighting with my White sharpie marker finishes the piece nicely. You can join me at my workshop on Thursday 26th May 5-7 to make one of these lovely flower tags. Just contact me to book your place. Back in a few days with an alcohol inks piece! Join me at the next Inky Addicts craft club in Eccles, Norfolk on Sunday 5th June – A fun day’s crafting and mini workshop for just £20. Click here for more info or to book. This is one of my favourite creations I’ve made in a while. The stamp is the lovely Bird and Blossom stamp from Stampendous that also has a matching die set too. 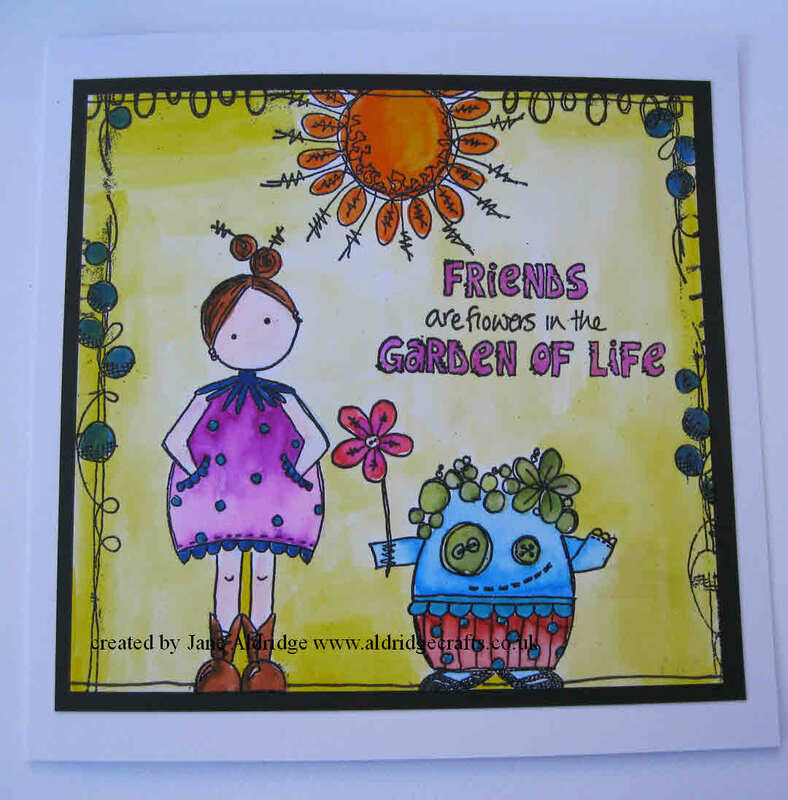 I started by stamping a selection of flowers and leaves as well as the bird and the branch and coloured them in bright colours using my Koi Brush pens using a waterbrush to get the lovely watercolour effects. I then used the dies to cut them all out – they cut really close! Next I used the Stampendous Pop-Up die on the blue cardstock and then stamped with a bubble effect stamp in the background in blue ink and stamped and embossed my greeting (a Stampendous stamp). I also used the die on my backing cream card too. I’ve found it is easier to cut your card slightly larger than needed, use the die and then trim to size – much easier than trying to position the die dead centre. By using the die on both layers, they will easily match up . Then push out the tabs you need and build up your flowers and bird design. This gorgeous pop-up card was made using the Stampendous Forest Stamps and matching Dies together with the Stampendous Pop-up Die. I started by stamping all the animals and lots of the bushes onto Woodware Watercolour Card. I added colour using the Koi brush pens and blended with a waterbrush. I used the pop-up die to create the pop-up structure and then layered up my tree and animals over the top. This makes such a lovely fun card! I love the way that the die set cuts so precisely, and there are three different dies to cut out the one bush stamp so you can vary the shape of the foliage in the tree. 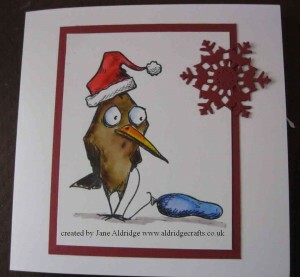 Love the crazy bird stamps for a Christmas card with a difference. I’ve used the Crazy Things accessories set to add his Santa hat and deflated balloon. I found it easier to stamp the santa hat first, then mask it off with Stix2 Masking sheets and then stamp the bird. The bird and balloon have been coloured using the Koi Brush Pens and a little water from a waterbrush to get a lovely watercolour look. 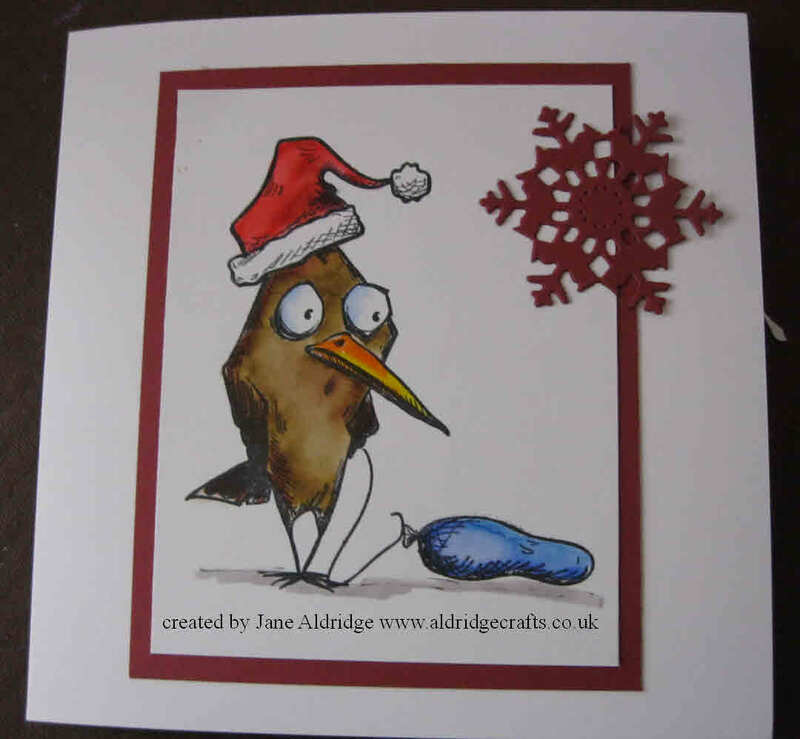 Perfect for a Christmas card with a difference!